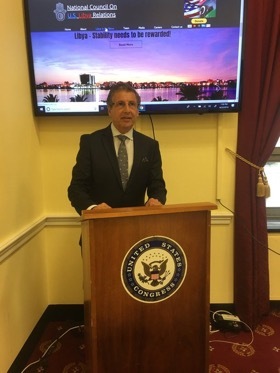 Breaking the Impasse in Libya: Ground Briefing and Workshop was held on June 22, 2018 at the United States House of Representatives. It was co-organized with the National Council on U.S. – Libya Relations. This closed and off-the-record meeting brought together individuals involved in Libya. Hani Shennib, Chairman, National Council on U.S.-Libya Relations, delivers opening remarks at the briefing.